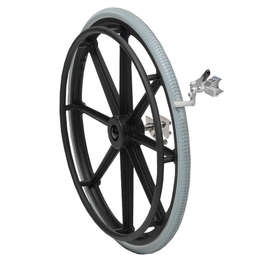 Self Propelling Wheel Conversion Kit for Adaptable Shower Commode Chair that can be wheeled to the area of use or over the toilet and reduces the amount of lifting for carers where the commode is used in more than one room. This shower commode has been designed to be able to adapt to a variety of situations, rooms and users. 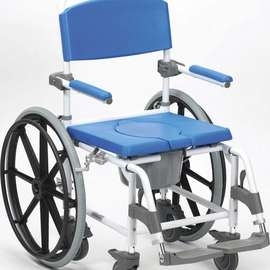 Made from a lightweight aluminium frame, it features a comfortable and attractive polyurethane (PU) seat, backrest and arms, which come in a bright blue colour to help people with visual impairments to see the seat. The high quality aluminium frame will remain rust-free if used in the shower or wet room. Transfers are made easier and safer, as the flip-up armrests and swing out footrests are quick and easy to remove, while the footrests also adjust in angle. As the shower commode is height adjustable, the chair is suitable for use over all standard size and most disabled toilets. Also features four braked castors that lock in both directions and move safely over varied indoor floor surfaces. Supplied with 5 litre potty and lid. An attendant-controlled version is also available. Overall Length: 870mm (34"). Overall Width: 560mm (22"). Height: 970-1020mm (38-40"). Backrest Height (from seat): 470mm (18½"). Armrest Height 700-750mm (28-30"). Seat Depth: 430mm (17"). Seat Width: 460mm (18"). Seat Height: 508-559mm (20-22"). Aperture Depth: 170 x 270mm (7 x 11"). Under Seat Clearance: 430-480mm (17-19"). Product Weight: 13.4kg (29lb).